These days a reader is assaulted almost daily by new books and authors enough to be easily overwhelmed if one keeps track of every single release. I remark this thing in genre niche, without expanding the affirmation to the entire book industry. In that case, keeping pace with every single new release that holds one’s interest in one way or another is nigh-on-impossible. Another downside of watching exclusively for new releases is losing track of previously published books and that would be a mistake. One of the authors who constantly appeared on the list of new book releases in the past 5 years is Kate Elliott. I never went near any of Kate Elliott’s titles released in the recent years, but since my intention was to give this author a chance I thought why not pick one of her earlier books rather than the new ones. 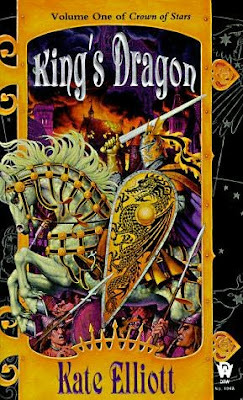 And my choice was Kate Elliott’s first novel in “Crown of Stars” series, “King’s Dragon”. Even from the start of the novel it is perfectly clear that the story gravitates around two characters, Alain, a fostered young man promised to the church and Liath, a young woman who is on a constant run together with her father. These are the starting points however and from here Alain and Liath begin their transformation and development as characters. Needless to say that their initial situation is dramatically changed in the first two chapters dedicated to Alain and Liath. I will go a bit ahead of myself and say that the good thing about these two characters is that although they match some familiar tropes of fantasy novels they do not end up fulfilling those clichés by the end of the novel. They do surpass their initial condition and become something else, but not following a too beaten road. Alain and Liath are two very well developed characters, but for half of the novel they occupy the center stage without leaving space for anyone else. More so, as much as credible these two characters are they did not manage to gain my sympathy at any point in the story. Alain and Liath suffer of too much self-consciousness, they tend to over think the matters at hand, to be almost completely aware of oneself. And that is their downfall for me. In the second part the stage is opened for more characters, but already the room left to maneuver them is small and therefore their evolution cut short. Kate Elliott sets the story of “King’s Dragon” in a world similar with the medieval Europe. Conflicts roam the land, personal political interests prevail, religion interferes with politics too much for its own good. However, Kate Elliott’s world is a matriarchy, the central political, economical and religious roles are occupied by women or influenced through mother descent. Most of all, the key religious positions in Wendar and Varre are reserved exclusively for females. This, I believe, is the result of the religious concept in “King’s Dragon”, one that reverses the catholic doctrine of holy mother and child, with the mother playing the most important role. “King’s Dragon” brings a welcomed change in this aspect, because I’ve read too many novels where male figures tied and cut everything and female figures were only small appearances or missed entirely. Since the religion of Wendar and Varre has at it’s a core a dualist theory so this element of the novel has a clear downside for its upside. And that is the omnipresence of the theological doctrine in the pages of “King’s Dragon”. It hardly passes a page or two without a reference, a gesture or an idea related to the religion to make its presence felt. There is no character, be it major, minor or figurant who is an atheist or has other religious conviction. I felt assaulted by it. You might think that there is only religion in “King’s Dragon”, but that is hardly the case. There are politics which lead to conflicts both internal and external. There is magic, mythical creatures and mystery surrounding the past of the world. And if the first half of the novel is focused on the development of the two main characters, the second half is the stage for the conflict and intrigue to play their roles. But what it is true for the minor characters can be applied to conflict and intrigue as well. The stage is too short for their performance. The pace falters and stumbles constantly while the rhythm is obscured very often, in the first half due to character development, in the second due to world-building. I was thrown away from the story in many occasions because the plot is interrupted by long passages in which magic, religion or history of this fictional world is presented, breaking the flow I managed to set for my reading until the respective point. Towards the end of the novel Kate Elliott concentrates more on the story and capture fully my attention with a series of very interesting scenes, especially battle scenes where the pace is uninterrupted by unnecessary details. Unfortunately, they come too late and as too little a compensation for the rest. As much as I respect Kate Elliott’s effort I have to admit that “King’s Dragon” was a constant struggle. It happened more than once to be on the point of stop reading the novel, but there were a few good elements that helped me bring the process to an end. I also feel a certain uncertainty in continuing the “Crown of Stars” series, there are too many conditions to be met for this, but I would not neglect Kate Elliott’s works entirely and I would give her other novels a chance in the future.